Partridge would go on to be an original member of the United States House of Representatives. When the Royal Governor of Massachusetts dissolved the Colonial Assembly, and the people of that colony called together an extra-legal Provincial Congress, a 34-year-old schoolteacher arrived to help lead the rebellion. George Partridge was chosen by the residents of Duxbury, a town about 35 miles from Boston, to Represent them in the new shadow government. By this time, according to letters he wrote years later, Partridge was committed to separation from Great Britain. When a new State Government was organized in the wake of the Declaration of Independence, George Partridge was again elected to that body. He was appointed to the Committee of Arrangement, which was responsible for the recruitment and pay of Massachusetts soldiers in both the Continental Army and State Militia. As raising the number of troops for the Continental Army became more and more difficult, Partridge’s Committee recommended that the State pay extra money to enlisted men on top of what the Continental Congress was offering. This plan was approved by State Assembly and brought to General Washington for approval. Washington referred the matter to the Continental Congress but was himself against the idea. Washington believed, based on prior experience, that having soldiers of the same rank make different amounts of money would cause division within the army. Additionally, it would make recruitment more difficult for other States who could not raise their price. Partridge when to Philadelphia to speak with the Continental Congress about the situation. His proposal was discussed but ultimately the resolution failed. George did win a small concession. Congress permitted the State to offer a ‘twenty-dollar bounty’ to a soldier who agreed to enlist for three years. While twenty dollars may not sound like a lot today, this was pretty big money in the late 18th century. As for men who enlisted for the duration of the war, the reward remained the same: 100 acres of land. After returning home, and having great trouble raising troops, George Partridge was chosen to again travel to Philadelphia. This time, he had been selected as a Delegate to the Continental Congress. Partridge remained a Continental Congressman for the better part of six years. During this time, he assisted in uniting the States to win the Revolutionary War. When the Constitution was ratified, George was selected to again represent Massachusetts…this time as an inaugural member of the United States House of Representatives! Want to read about other Founders who helped pay for the Revolution? Want to read more about paying Continental Soldiers? 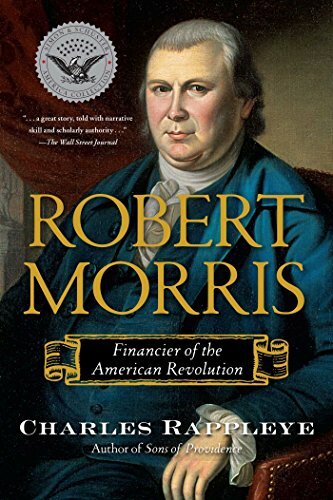 ‘Financier of the American Revolution’ is a biography about Robert Morris, perhaps the most underrated Founder, and his part in paying for the Revolution.